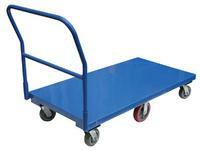 Heavy duty steel platform cart provides long term service. Removable handle. Rolls on (4) 5" swivel and (2) 8" poly rigid casters. Center caster provides great maneuverability. Ideal for industrial, commercial and warehouse use.